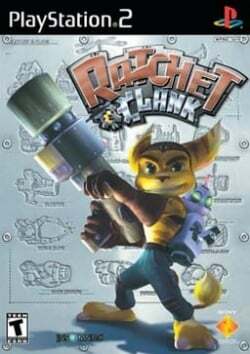 Game description: Ratchet and Clank team up to save the world from the evil Drek, the leader of a dead planet who drains resources all over the universe. As you progress from one alien planet to the next, you'll find or purchase over 36 weapons and gadgets, including a wrench, bomb glove, grappling hook, cannon, machine gun, and rocket launcher. Think about it--you can choose from burning, bombing, exploding or obliterating your enemies. So go ahead, blow it all up. Ratchet and Clank set out on a quest to gain the help of the famous superhero Captain Qwark to save the galaxy from the Blarg. • Fully playable aside from garbage textures and models at a small distance. • The weird colored models can be fixed by setting GSdx to software mode, the FPS will suffer a huge hit. • Can be slightly GPU heavy at parts where a lot is on-screen. USA v01.60(07/02/2002), Besides the graphical bugs mentioned below, everything appears to be working fine. FPS hovered around 60 FPS. Europe v01.70(27/02/2003), Still Playable. Game works fine at a good speed. Requires Software Mode to fix the graphics (Mipmapping), the game can be quite slow. I achieved pretty much constant full speed by putting VU Cycle Stealing to 1 and 4 Extra Rendering Threads for Software Mode (this game seems to like them a bit more than normal). The game runs smooth with almost no problems (with some light lag which is almost not noticeable). I was able to complete the whole game without any issues. Description: Garbage textures until you stand close to objects due to GSdx not supporting mipmapping in hardware mode. Workaround: This can be resolved with the latest v1.5.0 git builds. Go to Config > Video(GS) > Plugin Settings, and set Mipmapping to "Basic". Or switch to Software Mode by setting Renderer to any of the "(Software)" options. Note: To minimize the potential performance impact of Software Mode, set Rendering Threads to one less than the number of available CPU cores. Description: Most menu backgrounds are glitched in GSdx hardware modes. Workaround: Use software mode, or ignore it (gameplay is not affected). This page was last edited on 1 July 2018, at 18:04.